Syllabus of the Online Course (Subject): Economic Community of West African States (ECOWAS). Socio-economic Context of the West African Region: Benin, Burkina Faso, Cape Verde, Ivory Coast, the Gambia, Ghana, Guinea, Guinea-Bissau, Liberia, Mali, Niger, Nigeria, Senegal, Sierra Leone, and Togo. Challenges of the West African region. Project VISION 2020. Description of the Online Course: Economic Community of West African States (ECOWAS). 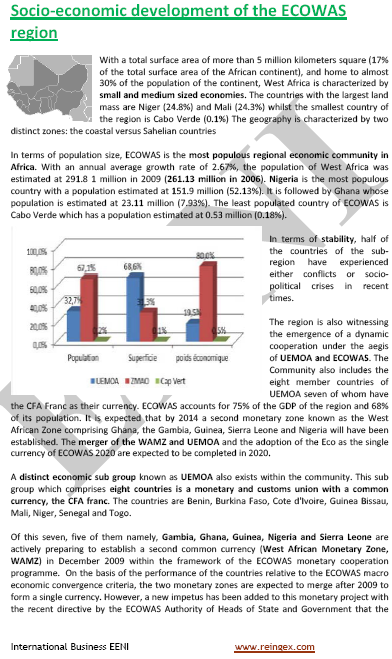 The Economic Community of West African States is the most populous regional economic community in Africa. 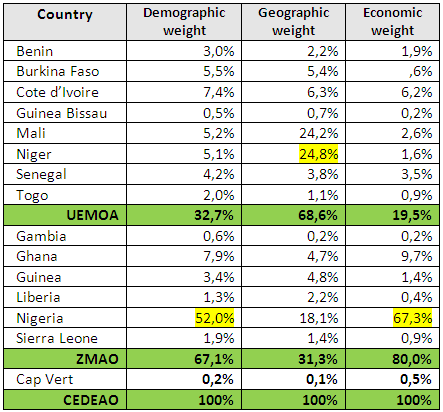 The Economic Community of West African States (ECOWAS CEDEAO) is a regional African trade bloc founded in 1975. The members of the Economic Community of West African States are Benin, Burkina Faso, Cape Verde, Ivory Coast, the Gambia, Ghana, Guinea, Guinea-Bissau, Liberia, Mali, Niger, Nigeria, Senegal, Sierra Leone, and Togo. The mission of the Economic Community of West African States (ECOWAS) is to promote economic integration in industry, international transport, telecommunications, energy, agriculture, natural resources, international trade, monetary and financial, social, and cultural themes. The West African Economic and Monetary Union (WAEMU) formed by Benin, Burkina Faso, Ivory Coast, Guinea-Bissau, Mali, Niger, Senegal, and Togo. 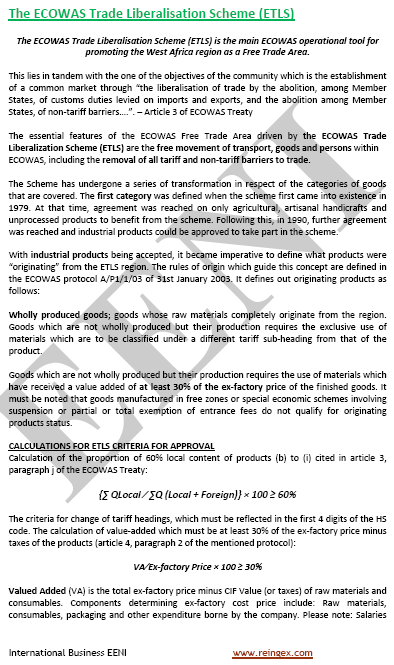 The Economic Community of West African States (ECOWAS) is working to resolve a possible conflict with other existing customs union in the West Africa region: The West African Economic and Monetary Union - by adopting Union's tariff band. The ECOWAS has signed a protocol on free movement and trade with the Mano River Union. The Economic Community of West African States (ECOWAS) has a bilateral trade agreement with Mauritania. 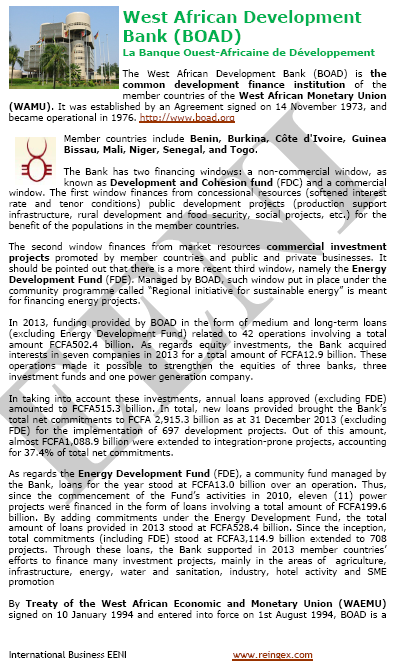 The Economic Community of West African States Commission (ECOWAS) and ECOWAS Bank for Investment and Development are its two main institutions intended to implement policies and carry out development project. The West African Monetary Agency is an autonomous specialised agency of the Economic Community of West African States. The West African Monetary Institute established under the Agreement of the West African Monetary Zone should perform its functions and carry out its activities in agreement with the WAMZ treaty. 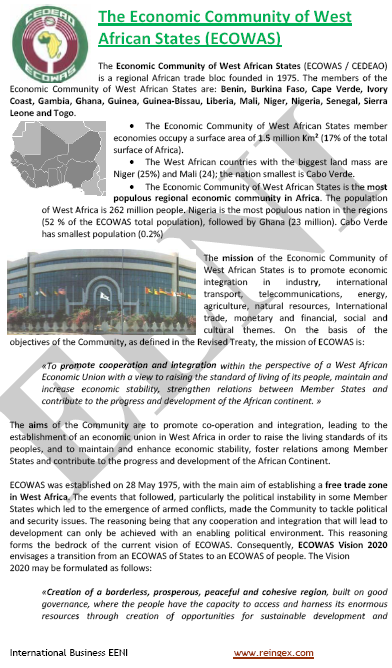 The Economic Community of West African States (ECOWAS) belongs to West African Economic Area (African Civilisation). 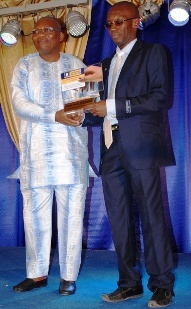 Ouandaogo Abdoul Karim (Student of the Master of Science in International Business University of Ouagadougou & EENI) winner of a WAEMU regional award.